Would Nesting Work for Us and Our Children after Divorce? Nesting refers to a situation where parents going through a divorce split their time between a shared home with their children and another independent space, in order to allow the children to stay in the home they knew before the divorce. Instead of the children travelling to each parent’s home during a parent’s parenting time, each parent travels back and forth between the family home and another place where they live during the other parent’s time with the children. The idea of nesting seems like something from a movie, but it is actually an interesting concept that could be very beneficial to children and make their adjustment to a divorce a little easier. There are pros and cons to nesting, and before the parents agree to this kind of arrangement, they should explore what it could mean for their particular situation. The main purpose of nesting is to spare the children the emotional turmoil of uprooting their lives because of the divorce. 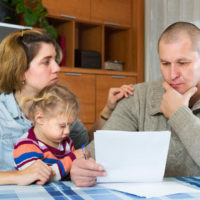 It can work well for the children who get to keep a constant in the midst of all the other changes that are going on as a result of the divorce. The children also get to stay in the same school district, and keep the same neighborhood friends. One major obstacle to nesting could be the cost involved. Not all couples can afford to pay the cost of maintaining the family home, paying rent or the mortgage, and utilities, and at the same time pay those expenses at another home or apartment. Even if the parents share the costs, it could get expensive. In addition, the parents would have to agree to respect each other’s belonging that are kept at the shared home, and to live by a set of rules that apply to each parent while living at the home. If the parents do not trust each other, then this may not be the arrangement for them. Unfortunately, one other drawback to this arrangement is the effect it may have on some children. While it may ease the emotional effect of a divorce for some children, for others, it may create an expectation that the parents are going to reconcile and get back together. The children may not have the opportunity to move on in a healthy way because they will not get a clean break when their parents’ divorce. It is important to consider if this kind of relationship would work best for your particular child, and discuss the implications with a professional if necessary. There may also be complications when one or both parents get into another relationship and decide to remarry. At that point the nesting arrangement may have to end, and the children will have to face the reality of the divorce. Divorce can be complicated and the process overwhelming to many people. If you are considering divorce and want to find out more about how the divorce may legally affect you and your children, schedule a meeting with our compassionate and experienced Boca Raton, Florida divorce attorneys, at the Law Offices of Schwartz l White to learn more.